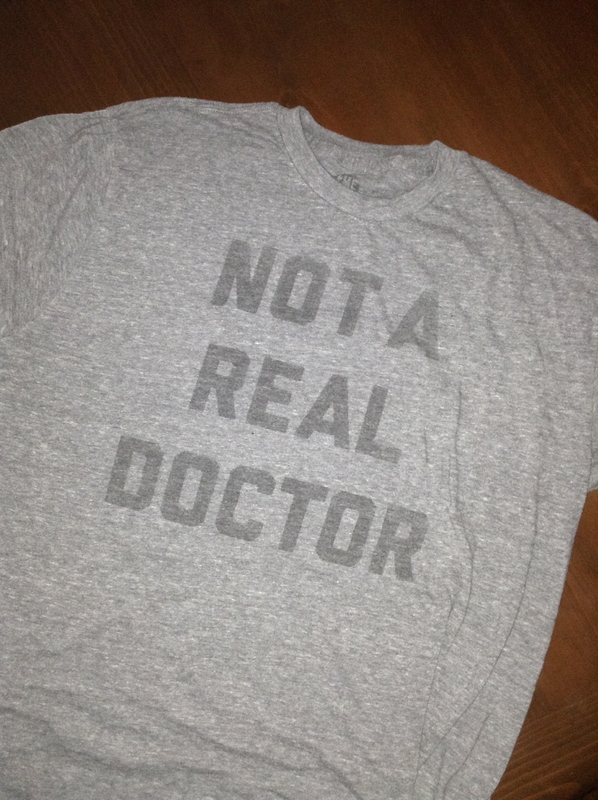 The shirt I’m wearing to this week’s doctor’s appt. As my daughter approaches her teen years, my level of stress and worry increases: drugs, alcohol, guns, driving, high school drama, school shootings, men and boys that may want to hurt her, ineffective antibiotics, the bird flu, and who knows what else my mind can conjure up. Wait, I do know: the end of the world and the complete breakdown of society as we know it. There I said it. Throw me in an underground holding tank with a deck of Uno cards and the rest of the doomsday nuts. However, before you do, I wonder if I and others haven’t been approaching parenting the wrong way. I mean we’re the protective generation of parents, aren’t we? We do everything we can to keep our children safe, which is a good thing. But I wonder if we should have been looking at the “big picture” instead of worrying about our kids falling off a swing at the park, or riding a skateboard without knee pads. Like doing more to make sure they inherit a habitable Earth. I know other generations of parents have worried about their children and the future. However, are we the first parents to ever have the concern of our planet being so screwed up it won’t be able to sustain life? 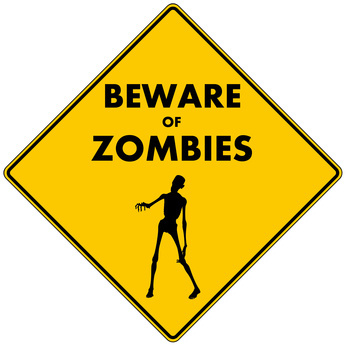 And, as life heads to a possible end with food and water shortages, overpopulation, a larger percentage of poor, rising sea levels and global warming, what will those last years of life on the planet be like? Yes, I worry too much. I know. I just wonder while the majority of us are working our asses off, and paying bills, and putting food on the table, and figuring out how to pay medical bills, and stressing about our jobs, who is keeping the planet safe from harm? Was that up to us too? Based on the number of stress-caused visits I’ve made to the emergency room in my lifetime, I’m the last person to give advice on dealing with stress. I share this video in the interest of helping others deal with something I’ve done a really lousy job of overcoming. And, thanks to the the content of this video, I think about stress in a different way now. Who knew it was so simple? I believe we make our own luck, but that doesn’t mean it’s not fragile and fleeting. For a long time it was stress and the fear of not waking up. Now, it’s something else. When I finally figured it out, it surprised me – a lot. Yes, luck, and thinking how lucky I am to have everything I have. A great and caring wife, a perfectly imperfect daughter, 1,850 sq. ft of house, with equity, black and yellow labradors, good friends, a job. Life hasn’t always been this way for me. But it has been lately. I am grateful for having so much in a world growing hotter every year, filled with too many people living in poverty, and too many people who believe they never have enough, though I can’t exclude myself from that last category many days. I’m surrounded by daily reminders of great wealth in Los Angeles: McMansions, 100K+ cars, and an environment where my daughter counted how many kids in her class brought MacBook Pros to school, making her inexpensive ASUS seem inferior, though I will be speaking to her that it’s not the computer that matters, it’s what you do with it. But what keeps me up nights is thinking about how lucky I am and how I could have it so much worse than I do. And wondering when I will. Disney Infinity: Best Video Game Ever? I built a racetrack in the sky with two double loops and a ton of banked turns, and lots of undulations. 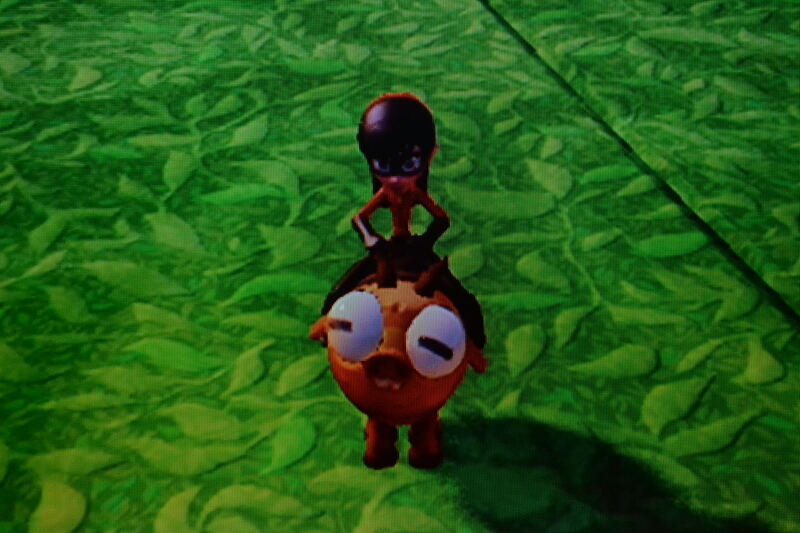 I played as one-eyed Mike Wazowski from Monsters Inc., and my daughter became Violet from The Incredibles. My big mistake: building it in the air. One slip of the steering wheel and it’s a long way down. She rode a horned-pig and I drove Mr. Incredible‘s car. But she was faster with the darn pig, as I kept driving off the track, cursing myself for building the track in the sky and not on land. So, I got my own pig. And she beat me again. But I was leading the second race when I crossed through the last loop-da-loop and headed for home. Things looked good until she and her cursed pig came out of nowhere and bumped me off the track. Falling, falling, falling, my hopes of winning dashed by an 11-year old delivering a blow as low as I’ve ever seen, making me angry and proud at the same time. 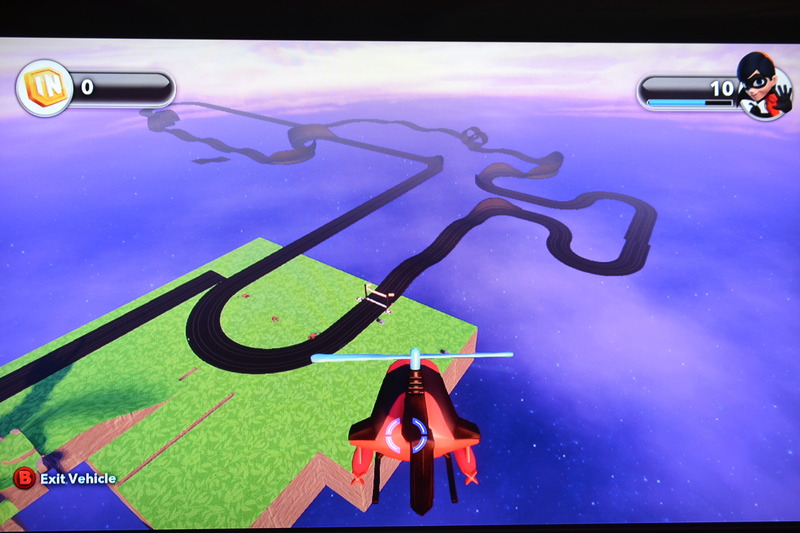 Deviled-pig racing is just one of the games we’ve created on Disney Infinity. We fought a paintball war royale. We raced cars at high-speed all over an empty island playing a game of car tag, and we’ve had numerous helicopter battles. And we’ve redesigned the different areas with buildings and towers and rope bridges. In a nutshell: We heart Disney Infinity. They call it a pig. I call it getting your rear-end kicked by your daughter riding something that loosely resembles a pig. Is it the best video game I’ve ever played? I’m not sure yet, but it’s up there because of our ability to use our imaginations and create our own games. The only downside is the potential cost of buying add-ons, like more characters and trading packs that cost 5 bucks a pop and give you more powers. Can you say, Disney Goldmine? There is, however, a happy ending to my story. My daughter and I had another pig race across floating islands we connected with rope bridges, and, just as young Violet was about to cross the finish line and win, I, Mr. Incredible, nailed her in the back with a paintball, causing her to run headfirst into a boulder, and allowing me to pass her and win. I realize there’s a lot wrong with a sentence like that but it was all in good virtual fun and I won, teaching the young one never to underestimate the power of someone who wasted his youth in arcades playing Frogger and Pac-man, and who hates to lose. That’s about the best I can muster right now. Whereas, on the steroids and Cayston, that would have been a low for me. Argh. Most people go their entire life without knowing their FEV1. How lucky is that? Now that I bought this little FEV1/6 meter, I know mine every day, and throughout each day. It’s a love/hate relationship. Or at least one of happiness, or frustration, depending on the results. It’s the medical equivalent of a mood ring for me. 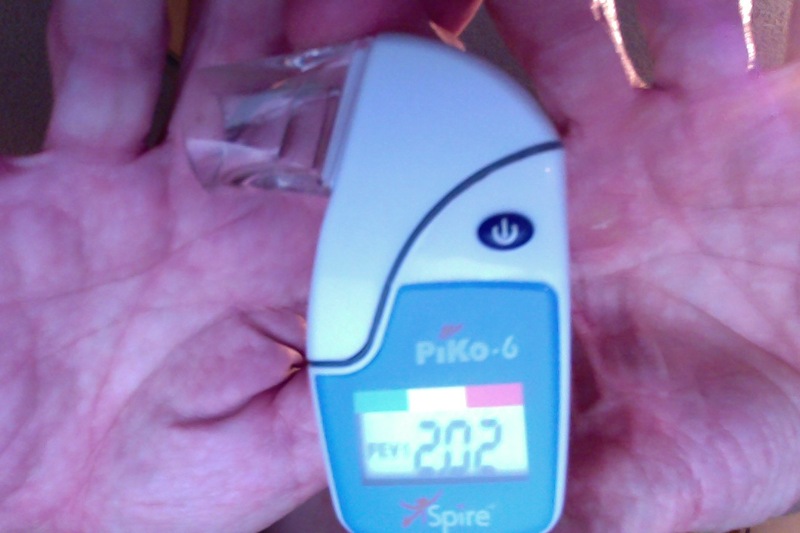 On the plus side: The tiny meter did help the doctors diagnose the TOBI podhaler bronchospasms, which were solved by eliminating the podhaler and adding oral steroids and Cayston. The not-plus side: Over the past 3 weeks, since staring inhaled Tobra through the eFlow, my numbers continue to go down, but not as quickly as the podhaler. 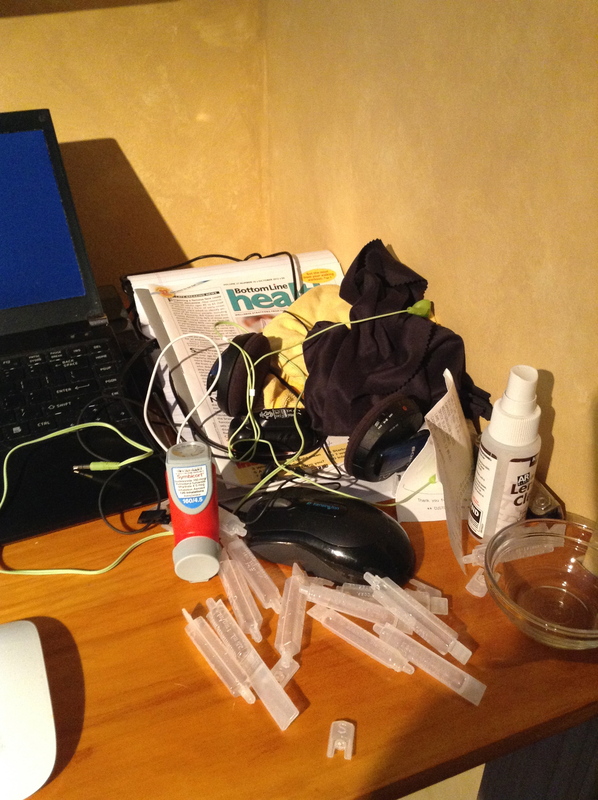 So, the guessing game begins: Am I having bronchospasms? Is the Tobra not hitting the bugs as well? Would oral steroids work again? Is it allergies? Am I reacting to M&Ms or something else I’m eating? What am I doing to cause the FEV1/6 drop? It’s difficult to impossible to answer, as I’m not running my life to the standard required for a scientific experiment. CF is so sophisticated I don’t know if it would matter if I did. Just one more reason to hate the disease.